"She grew out of her shell and became a strong and well-respected leader among the cadets", St. Pete Police Academy ( now retired) Director John Dressback told me in 2011. " She was a friend to everyone who knew her and everybody liked her," he had said with a slight waver in his voice. Kelly had shown a special interest in the area of Domestic Violence at the Academy and many felt that her desire to leave David Perry stemmed from the confidence she was starting to feel as she learned more and more about women who overcame serious domestic and physical abuse, often at the hands of the people who purported to "love' them. But Kelly would never see the day of graduation, never again feel the soft light of the sun on her face, never again see a family that David Perry did his best to isolate her from, a family that loved and missed her. In an instant, Kelly was missing; David Perry suddenly cleaned up the condo they shared, and then took off suddenly, showing up in Elmira, New York the next day at his home there. He told his daughter Brittney and her husband Kyle who were living in the Elmira home at the time that they were "going to hear a lot about him in the next couple of days and to not believe it". Then he took off again. It was then that I think he left with Kelly's lifeless body still in his trunk, and headed out of town in a hurry. He was traced to several places; he told someone that he was going to "look for Kelly at her favorite spot." He was traced to Oklahoma, where he stayed a few days at a hotel off of the highway, then his trail went dark. He ended up back in Elmira about a week later, refusing to allow New York authorities, working with Pinellas County detectives to search his car. It was only after two weeks had gone by, March 24th, that Perry finally relinquished the car to New York detectives. They said there was a pervasive smell of disinfectant and bleach. Curiously, there was NO female DNA found at ALL in the car... highly unusual as Kelly and he used to drive together in that blue Honda all the time. The car had been wiped clean by the obsessive /compulsive neat freak, who once yelled at Kelly's sister for putting a water bottle on the counter at their condo. "But," he said, " there have been leads and phone calls that have come in and we have pursued every one of them. And we've looked at these leads more than once and we're continuing to pursue them." But Bailey admits that without Perry's or his family's cooperation,it is much more difficult to find the smoking gun; the one piece of evidence that could solve the case and the mystery that is Kelly's disappearance. I asked Bailey if he thought that Perry would have taken Kelly's body to New York after he allegedly killed her. It has always been my theory that he did. Bailey is not so sure. "It doesn't seem logical that someone would drive that far with a body in the trunk. Common sense says that a person wouldn't do that, but I guess anything's possible." When I asked Bailey if he thought that Kelly's body could be in New York, he replied, "New York is a big place." But I think that Perry DID drive Kelly's body after he killed her that Saturday afternoon; he comes from New York and knows the area well. He has hunted the vast woods up there and would know just where to put Kelly were no one would be looking for her. He has counted on the fact that Pinellas County Sheriffs wouldn't have the resources to follow up on possible leads or be able to search such a large area The New York authorities are frustrated as well; some think that she is up there too. But Kelly's disappearance is not their case; they are only pursuing him on the charges of Felony Grand Larceny and Fraud. But some have admitted that there is a real possibility that Kelly's remains lie somewhere upstate. If this is the case, then David Perry may have committed the perfect crime.. a heinous crime against a beautiful young, vibrant woman who only wanted to make the world a better place, through service and goodness. Today is especially hard on Kelly's family; it is a milestone anniversary and a sad mystery that seems to have no end in sight for an acceptable conclusion, that of finding Kelly and bringing her home. They are in limbo in the grief process. 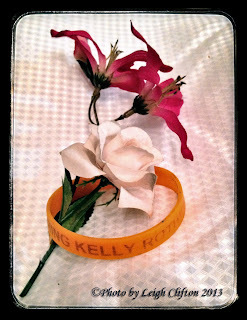 Said Kelly's Mother Nancy Rothwell last night, "You have your good moments and your black ones, but we have to go on. Its the not knowing that is so hard to deal with. But Kelly's sister Kristen called me to check on me tonight; and she said something so beautiful; she said that Kelly was a very beautiful person and that she was dearly missed. I'm thinking of her, she said. I thought that was such a beautiful thing to say and Kristen was so right about that. Kelly was a wonderful daughter. I miss her and its tough sometimes..." Nancy's voice trailed off. The family on the whole is doing better; they've come together more as a result of such a tragic loss. Lauren Rothwell, one of Kelly's two younger twin sisters was sad but also realistic. Meanwhile David Perry sits in jail in New York. According to Steuben County District Attorney Brooks Baker, one of the two DA's that are prosecuting Perry in two different counties, Perry's defense attorney has refused to respond. He is moving forward with the felony assault charge that Perry incurred when he tried to put another prisoner, William Hargrave, through a wall last fall. Hargrave sustained enough injuries that he required hospitalization. Baker is currently waiting on Motions for that. Baker also filed an Appellate brief in response to the Grand Larceny charges that were dropped on Perry last fall. Baker feels confident that the charges will be restored. " We have moved the court to settle the record as defense counsel refuses to respond.". Neither Perry or his attorney John Scanlon has said much of anything. In his last court appearance, Perry repeatedly pleaded the 5th, refusing to answer. Instead he sat with a smirk on his face in the courtroom.. So where are you Kelly Rothwell? How could such a kind soul as you been subject to the evil that is David Perry? I woke up this morning and the sky was black and rain was falling. It looked so sad and dismal and I thought, "the sky is weeping for Kelly, weeping for what was, weeping for what could have been." Hopefully one day you will have justice. I still wear my bracelet with your name on it.. it is a constant reminder that you're not where you're supposed to be... home with your family. You were betrayed by people who said they loved you and you deserved so much better..